Almost all Harmony remotes have a ‘Help’ button. Ever wondered what is for? It’s there to guide you through fixing issues that you might encounter powering your AV devices on or off, or changing the inputs during an activity on your Harmony Remote Control. This can be especially helpful when you are not at home and something doesn’t power on or switch inputs for a family member using the entertainment system. The ‘Help’ button will guide anyone through fixing the issue in your absence; no cheat sheet required. By the time you’re done answering the questions, all of your AV equipment will be synchronized with what your Harmony remote needs to operate your system successfully. If you find that you need to use the ‘Help’ button frequently, you might want to look into adjusting some of the settings for the device in the Harmony Remote Control Software. The most common reasons for frequent ‘Help’ button use are related to device delays. InterDevice Delay – If your issue is related to a device that doesn’t power on without using ’Help‘, try increasing the InterDevice Delay. Input Delay or Power On Delay – If your issue is related to a device that doesn’t change inputs properly without using ’Help‘, try increasing the Input Delay or the Power On Delay. Depending on the specific issue; check both FAQs if you’re unsure. Remember to update your Harmony Remote Control after you make any adjustments to your account, including adjusting device delay settings. Be sure to check back every week for more Harmony tips and tricks and feel free to send us your comments. I need to control 3 of the same model TVs mounted on the same wall close together, two hd direct tv receivers,one comcast hd settop box, a dvd player and a surround sound receiver, and a hdmi matrix switcher. If I need to have assignable control for the three tvs and the two hd direct tv receivers how many blasters and target specific flashers will I need. the only function for the tvs will be power on and off. They will remain on the same input. What I am wondering is; can I utilize ir and rf at the same time? Is it possible to have one blaster with one port for one of the tvs and one of the direct tv receivers and the other port for the second tv / direct tv combo, while using the ir signal for comcast and the third tv, dvd player, matrix switcher and surround receiver? It is possible to control multiple versions of the same TV & set top box with a single remote, but only with the Harmony RF capable versions. The Harmony 900 comes with 1 RF Blaster, but you would need to purchase a 2nd one and IR Precision cables to control your set up. With the Harmony 900 & 2 RF Blasters and IR Precision cables you are able to assign each TV to a single RF Blaster & Single IR port on that Blaster (There are two labeled A & B). First TV would be Blaster 1 on Port A, second TV would be Blaster 1 on Port B, and third TV would be Blaster 2 on Port A. This will allow you to isolate the IR signal to a specific IR emitter and gain independent control. 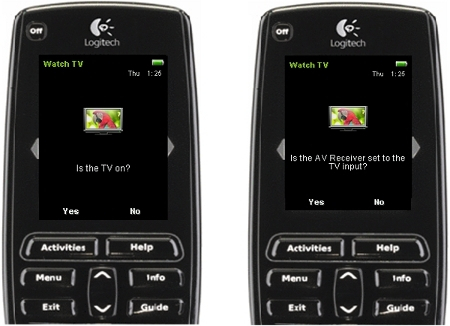 As for IR & RF, the Harmony remotes always send our IR signal to your devices, you just choose if the Harmony Remote or one of the RF Blasters will be sending out the signal. Therefore you can have one Blaster with one port for one of the TVs and use the Harmony remote to send IR for the Comcast.